Today, almost half of all undergraduate students in the United States attend community college. A report from the Digest of Education Statistics shows that this amounts to just over 10 million students which is 42% of all undergraduate students. This makes two-year institutions an integral part of higher education. Unlike the students that attend 4-year colleges and live on campus, most community college students commute. So while they’re spending time on campus, it’s important that community colleges are providing a way for these students to charge their phones. If you live 30-45 minutes away, it can be a major inconvenience to have your phone die without any charging solution. The best community colleges are providing students with a charging solution, is yours? Students are attending community colleges for a number of reasons, beyond the necessary preparation for 4-year schools. With the rising cost of tuition at colleges and universities, the cost of tuition at community colleges is very appealing. The financial advantage of a junior college can be extremely appealing–many costing less than $2,000 a semester for a full-time student. Community colleges, have to stay competitive with the on-campus amenities they offer. Technology on campus is arguably the most important among them. A community college campus must provide amenities that cater to students who are commuting to campus and staying there for most of the day. Quiet rooms, lounges and on-campus restaurants are a good place to start, but in an age where most students own and use smart phones for just about everything throughout the day, cell phone charging stations are truly the ultimate amenity. 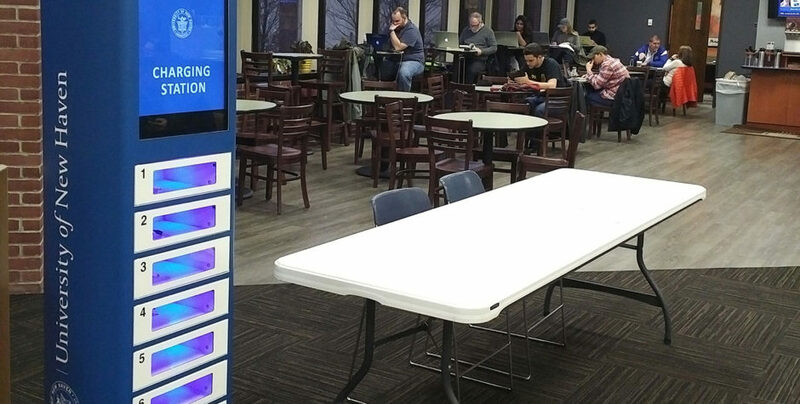 Higher education institutions everywhere are jumping on the phone charging kiosk bandwagon. Veloxity is a leading supplier for these products, and many institutions turn to us because we provide easy and high quality chargers. Students and faculty alike are using the cell phone chargers to give a quick boost to their cell phone battery in between classes. One of the struggles of most community colleges is often the lack of involvement of the student body. This complacency outside of the lecture halls can be mitigated by campus amenities and reasons to stay on campus and stay involved. With most students traveling to campus without their cell phone chargers, you can give them a reason to remain on campus, fully charged and maybe even open to joining in. Having a secure place for students and faculty to charge their phones is also a good way to keep them safe. As community colleges are commuter based it is important to have a charged cell phone for their commute home. What is your school doing to boost its technological amenities for students? Let us know by leaving a comment.